HELP Cellular CDMA 3.4 V/28 DBm Linear Power Amplifier Mod,The AWT6307R meets the increasing demands for higher efficiency and smaller footprint in CDMA 1X handsets. The package pinout was chosen to enable handset manufacturers to Switch from a 4 mm x 4 mm PA module with few layout changes while reducing board area requirements by 44 %. The AWT6307R uses ANADIGICS exclusive InGaP- Plus technology, which combines HBT and pHEMT devices on the same die, to enable state- of-the-art reliability, temperature stability, and ruggedness. The AWT6307R is part of ANADIGICS High-Efficiency-at-Low-Power (HELP) family of CDMA power Amplifiers which deliver low quiescent currents and significantly greater efficiency without a costly external DAC or DC-DC Converter Through selectable bias modes, the AWT6307 achieves optimal efficiency across different output power levels, specifically at low- and mid-range power levels where the PA typically operates, thereby dramatically increasing handset talk-time and standby-time. Its built-in voltage Regulator eliminates By Anadigics, Inc. This is one package pinout of AWT6307R,If you need more pinouts please download AWT6307R's pdf datasheet. 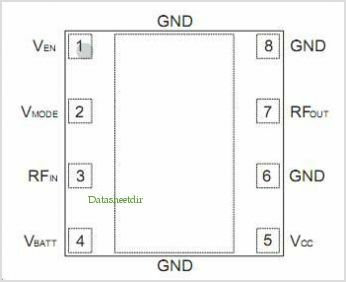 This is one application circuit of AWT6307R,If you need more circuits,please download AWT6307R's pdf datasheet.